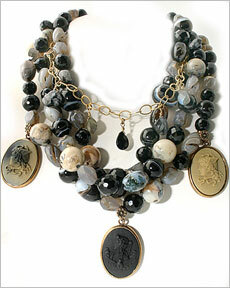 Victorian Jewelry History: Victorian Cameo & Intaglio Jewelry, Charms and Mourning Jewelry. The History of Victorian Jewelry in four paragraphs? Impossible! 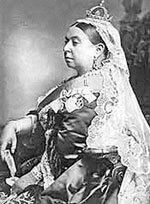 Here's the challenge  the era officially starts in 1837 with the coronation of a very young Queen Victoria. It ends with her death at the age of 82, in 1901. This woman LOVED jewelry. She designed it, wore it, and gave it as gifts through the rise of the British Global Empire, the inception of the industrial revolution, and the reaction to mass production that gave birth to the Arts and Crafts Movement (1870-1914). Her passion and preferences fueled the talents of the jewelry trade of London her whole life, most markedly upon the death of her beloved husband, Albert. But before we delve into Mourning Jewelry, lets look at a couple other themes that flourished during the Victorian Age. At the beginning of the 1800s a single hand carved semi precious gem Intaglio or Cameo was an extremely rare and treasured possession. It was about then, 1807 or so, that shell cameos experienced a resurgence. Conch shell cameos were still carved by hand, mostly by artisans along the Italian coast. They grew in popularity partially because the relative ease of carving shell over stone opened up a whole new level of artistry. It also allowed for production carving, which was faster, more formulaic. The end result was a cameo that was both affordable and beautiful. It became the perfect token of that Victorian tradition of the "Grand Tour"  a trip often taken by the upper classes of the Northern climes of Europe to experience the art and culture and mild climate of Italy and Greece. They would return from their journey with Italian carved shell cameo necklaces, rings, and earrings, or the even more highly coveted lava stone cameos, carved out of the earthy colored lava from the base of Mt. Vesuvius. The industrial revolution began to gain steam and with it came more affordable manufacturing techniques, pressed glass for glass intaglios, stamped or cast metal for settings, and chain making machines. Nobility and the wealthiest merchants were no longer the only people who could afford a selection of jewelry to accent their wardrobe. 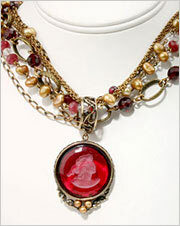 Queen Victoria may also get the lions share of credit for popularizing the charm bracelet and charm necklace, as we know it. She had a series of charms designed and produced to give as gifts to her extended family and circle of friends every New Year. 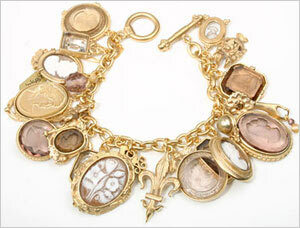 In 1861, Prince Albert died, and again Queen Victoria influenced the direction of jewelry design and production. She went into permanent mourning--only wearing black clothing and black jewelry for the rest of her life. for several years all of England followed her example. Jet, a fossilized driftwood, suddenly became the material of choice for jewelery. And what a stroke of luck that was for the good people of Whitby, on the coast of Yorkshire. They were sitting on the finest Jet deposits of the world. 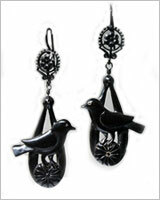 Carved Jet chains, Jet Crosses, Jet pins and earrings--indeed every style heretofore offered in colorful gems, glass and metal, were now produced in Jet. Commonly uses unusual materials, techniques, non-precious stones, and production manufactured metal work. 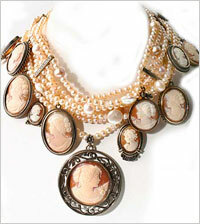 Extasia is a company of American artisans, committed to re-inventing Victorian Jewelry for Contemporary Fashion. We use hand-carved Italian shell cameos, hand-pressed German glass intaglios, jet, vintage glass, and semi-precious gem materials, combined with the gold plated, bronze and sterling silver settings we design and manufacture, here in northern California. *Images used in this essay incorporated Extasia products.